MORE than 1,000 people are now unaccounted for after the deadly Californian wildfires. Donald Trump travelled to the site of the most destructive fires in the state’s history yesterday where 71 people are known to have died. The number of those unaccounted for has continued to climb, however. The death toll was raised to 71 after eight more bodies were found, while the missing persons list grew from 631 to 1,011. Butte County Sheriff Kory Honea said the list was “dynamic” and could easily contain duplicate names and unreliable spellings, as well as some who fled the blaze and do not realise they have been reported missing. Some of the people among the ever-evolving tally have been confirmed as dead by family and friends on social media. Others have been found safe, but authorities have not yet marked them as such. In last year’s catastrophic wildfires in California wine country, Sonoma County authorities at one point listed more than 2,000 people as missing. But they slowly whittled down the number. In the end, 44 people died in several counties. 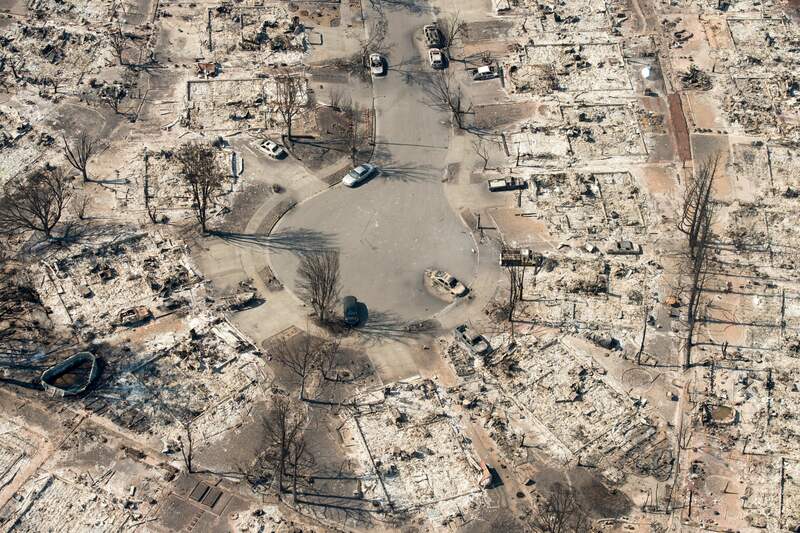 The wildfire this time all but razed the town of Paradise – population 27,000 – and heavily damaged the outlying communities of Magalia and Concow, destroying 9,700 houses and 144 apartment buildings. Searches were also continuing for those who perished and those who survived, ahead of a visit by Donald Trump. Some survivors resent that Mr Trump took to Twitter two days after the disaster to blame the wildfires on poor forest mismanagement. He threatened to withhold federal payments from California. “If you insult people, then you go visit them, how do you think you’re going to be accepted? You’re not going to have a parade,” said Maggie Crowder, of Magalia. On the eve of his visit, the president last night repeated his criticism. In southern California, meanwhile, more residents were being allowed back into their homes near Los Angeles after a blaze torched an area the size of Denver and destroyed more than 600 homes and other structures. The blaze was 69% contained, authorities said.